Atherosclerosis is the major cause of myocardial infarction. This disease is characterized by the formation of fatty plaques that obstruct the passage of the blood in the arteries due an increase in concentration of lipids, cholesterol and triglycerides levels in the blood. Thus, the present article aims to evaluate the possible hypocholesterolemic and hypotriglyceridemic effects of Scoparia dulcis ethanolic extract. In this way, Wistar rats (230-250g) were treated with Dexamethasone phosphate to induce the increase of cholesterol and triglycerides, followed by Atorvastatin (10mg/kg, i.p.) or by the extract of Scoparia dulcis (500mg/kg) (EcEtOH). The results showed that EcEtOH was able to reduce cholesterol levels, however it not reduced triglycerides. This activity may be explained by the presence of chemical compounds such as saponins and flavonoids. Thus, Scoparia dulcis may be used as a complementary therapy in the treatment of hypercholesterolemia in the future. According to the World Health Organization, cardiovascular disease is the leading cause of death in the world. It is estimated that by 2030, around 20 million people will die because of them.1,2 Atherosclerosis is the major cause of myocardial infarction, and it is characterized by the formation of fatty plaques that obstruct the passage of the blood in the arteries, it occurs due an increase in concentration of lipids in the blood (hyperlipidemia), as well as cholesterol (hypercholesterolemia) and triglycerides levels (hypertriglyceridemia).3 The detection of hyperlipidemia and its prevention may reduce the risk of deaths from atherosclerotic diseases.4 The pharmacological treatment of hypercholesterolemia consists of the use of several classes of drugs, such as Statins (HMG-CoA reductase inhibitors), bile acid sequestering resins, ezetimibe, fibrates, nicotinic acid and omega 3. However, these therapies lead to the appearance of several side effects.1 Plants and their derivatives have been used extensively for their therapeutic properties. They are an important therapeutic alternative because of the presence of bioactive compounds and biological activities.3 In this scenario, Scoparia dulcis, popularly called as Sweet Broom, Licorice Weed, and Vassourinha, is traditionally used in the treatment of diseases such as hypertension, diabetes, bronchitis and gastrointestinal disorders, once it presents a large amount of active compounds, such as terpenes, steroids and flavonoids.5 Thus, the present study aims to evaluate the possible hypocholesterolemic and hypotriglyceridemic effect of Scoparia dulcis. Wistar rats weighing 230-250g were employed in this study. All animals were kept on a standard 12-hour light/dark cycle, in a temperature-controlled environment (23±2°C), and they had access to water and food ad libitum.6‒8 The animals were housed in groups of six per cage and each group received a specific treatment. All experiments and procedures were approved by Committee on Animal Research and Ethics of Centro Universitário Santo Agostinho, according to current Brazilian law 11.794/2008. All animals were treated daily with intraperitoneal injection of Dexamethasone Phosphate (1mg/kg) for 5 consecutive days to induce the increase of cholesterol and triglycerides. In addition, one group was treated with atorvastatin (10mg/kg, i.p.) or received the extract of Scoparia dulcis (500mg/kg) (EcEtOH).6‒8 As control, one group only received distilled water (Vehicle) and another group was treated only with Dexamethasone. The blood was collected through the retro-orbital venous plexus (5ml) and the serum was obtained by centrifugation. The total cholesterol was measured using a Kit Cholesterol Liquiform, Labtest Diagnostica, Lagoa Santa, MG, Brazil, following the manufacturer`s instructions. To determinate the concentration of triglycerides, it was used a commercial kit (Triglicérides Liquiform; Labtest Diagnóstica, Lagoa Santa, MG, Brasil) and following the manufacturer's directions. After 5 days of treatment, the vehicle group had an increase of 3.2% (6.3g) of the body mass. In contrast, the animals that received only dexamethasone phosphate showed a decrease of the body mass around 13.9% (25.8g). The food intake was not measured, however all animals had approximately the same amount of food. Changes in lipid metabolism rise the weight of humans, such as occurs, for example, in Cushing's syndrome or in patients treated chronically with glucocorticoids. The opposite occurs in rats, as previously described the animals treated with dexamethasone phosphate reduced their body mass. Besides the decrease in weight, studies also have reported the development of hypercholesterolemia and hypertriglyceridemia after treatment with dexamethasone. It can be explained by the intense lipolysis caused by insulin resistance in the adipose tissue, increasing fatty acids on plasma. Moreover, there also are a permissive effect of glucocorticoids towards lipolytic action of adrenaline and noradrenaline. 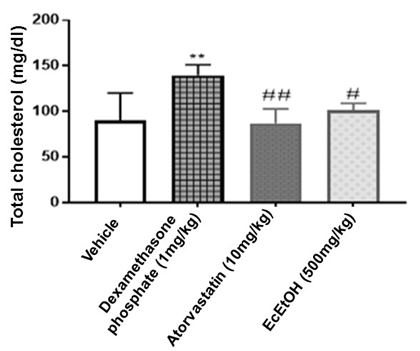 Dexamethasone is a glucocorticoid that stimulates hepatic gluconeogenesis releasing fatty acids and glycerol from adipocytes and amino acids, increasing hepatic glucose production and hyperglycemia.7,8 Graph 1 shows a significant decrease of total cholesterol in the EcEtOH group (101.14±3.45**) compared to the group that only received dexamethasone phosphate (139.64±5.73). Moreover, there was no significant difference between Atorvastatin and EcEtOH groups. These findings demonstrate a similar effect of this substances, in other words, the effects of EcEtOH on cholesterol are similar to Statins therapeutic effects. In addition, the similarity between EcEtOH and the Vehicle group shows the capacity of the extract to decrease serum total cholesterol. Graph 1 Biochemical analyzes of total cholesterol. Graph 2 shows the values of triglycerides. 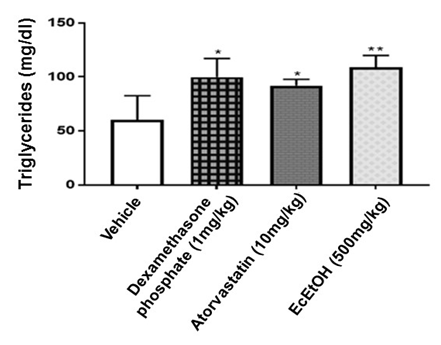 It is observed that EcEtOH and Atorvastatin groups had no significant differences to the group treated with dexamethasone phosphate. According to the literature5, Atorvastatin does not reduce triglycerides, it only reduces cholesterol levels. Considering the similarity of effects, we hypothesize that the mechanism of action of the extract may be the same of Statins. Okhale et al.,10 demonstrated several chemical constituents are present in Scoparia dulcis as coumarins, phenols, saponins, tannins, amino acids, flavonoids and terpenes. Oliveira et al.,11 proved that flavonoids have the capacity to reduce levels of total cholesterol and triglycerides, because they increase the activity of the enzyme Lecithin–cholesterol acyltransferase, which converts cholesterol into esters to be metabolized. Moreover, flavonoids also increase the activity of the lipoprotein lipase enzyme, which catalyses the hydrolysis of fatty acids and monoglycerides from triacylglycerols. Thus, hispidulin, a flavoinde present in Scoparia dulcis, may be associated with the decrease of cholesterol levels, also through AMP-activated protein kinase (AMPK), which can reduce cholesterol synthesis. Hypocholesterolemic activities are also associated with saponins, because their sterol-binding property may increase the excretion of cholesterol. It is also hypothesized that saponins have irritating effects on the gastrointestinal mucosa, because they form insoluble complex with cholesterol of the membranes, causing damage to its integrity and preventing the absorption of cholesterol in this area.12 Several phytochemical studies regarding Scoparia dulcis show that it has a variety of chemical compounds.13 According to Oliveira et al.,11 Castejon et al.,12 and Ferreira et al.,14 flavonoids and saponins are the key substances to decrease cholesterol levels. Thus, the presence of these chemical compounds can explain the hypocholesteroleminant activity of ethanol extract of Scoparia dulcis. Graph 2 Biochemical analyzes of triglycerides levels. The acute treatment with ethanolic extract of Scoparia dulcis (EcEtOH) was effective to reduce total cholesterol induced by dexamethasone; however, the extract did not present significant reduction in triglycerides levels. In the future, Scoparia dulcis may be used as a complementary therapy in the treatment of hypercholesterolemia, however further tests are necessary. Authors have none to declare. Santos RD, Gagliardi AC, Xavier HT, et al. I Guideline on fat consumption and cardiovascular health. Arq Bras Cardiol. 2013;100(1):1‒40. Pereira LP, Sichieri R, Segri NJ, et al. Self-reported dyslipidemia in the Center-West region of Brazil: prevalence and associated factors. Cien Saude Colet. 2015;20(6):1815‒1824. Pizziolo VR, Brazilian BG, Oliveira TT, et al. Plants with possible hypolipidemic activity: a bibliographical review of books published in Brazil between 1998 and 2008. Bioscience Journal. 2011;13:98‒109. Sposito AC, Caramelli B, Fonseca FA, et al. IV Brazilian Guideline on Dyslipidemias and Prevention of Atherosclerosis: Department of Atherosclerosis of the Brazilian Society of Cardiology. Brazilian Arq Bras Cardiol. 2007;88(Suppl 1):2‒19. Mishra MR, Mishra A, Pradhan DK, et al. Antidiabetic and antioxidant activity of Scoparia dulcis linn. Indian J Pharm Sci. 2013;75(5):610‒614. de Lellis Santos C, Rafacho A. Effects of dexamethasone administration in vivo on glycemia, insulinemia and circulating substrates are time-dependent. Bioscience Journal. 2007;23(3):101‒110. Pinheiro CH, Sousa Filho WM, Oliveira Neto J, et al. Physical exercise prevents cardiometabolic changes induced by the chronic use of glucocorticoids. Arq Bras Cardiol. 2009;93(4):400‒408. Celeski IC, Fergutz JK, Pereira EM, et al. Evaluation of the induction of hyperlipidemia in rats by dexamethasone and coconut oil. Infarma-Pharmaceutical Sciences. 2013;25(3):126‒131. Zulfiker AH, Rahman MM, Hossain MK, et al. In vivo analgesic activity of ethanolic extracts of two medicinal plants - Scoparia dulcis and Ficus racemosa Linn. Biol Med. 2010;2(2):42‒48. Oliveira TT, Dornas WC, Nagem TJ, et al. Flavonoids and atherosclerosis. Revista Brasileira de Analisis Clínicas. 2010;4(1):49‒54. Castejon FV. Tannins and saponins. Seminar presented at the discipline Applied Seminars of the Post-Graduation Program, Goiânia: Federal University of Goias; 2011. Wankhar W, Srinivasan S, Rajan R, et al. Phytochemicals screening and antimicrobial efficacy of Scoparia dulcis Linn (Scrophulariaceae) against clinical isolates. Journal of Pharmacognosy and Phytochemistry. 2015;3(6):17‒21. Ferreira F, Vázquez A, Güntner C, et al. Inhibition of the passive diffusion of cholic acid by the Ilex paraguariensis St. Hil. saponins. Phytotherapy Research. 1997;11(1):79‒81. ©2018 Santos et al. This is an open access article distributed under the terms of the Creative Commons Attribution License , which permits unrestricted use, distribution, and build upon your work non-commercially.